I am able to change the width of the form, but there is still unwanted space on the left side of the form in my txt box and txt areas. I only have 208px to play with so I need to get rid of the padding on the left, top and right side of my form. Any suggestions? Can you please take a look on the screenshot below of your website if thats what you want to achieved? Thats exactly what I am trying to do with less space between the header contact me and the email address. Here is the final form I am hoping for. Thanks for you help! 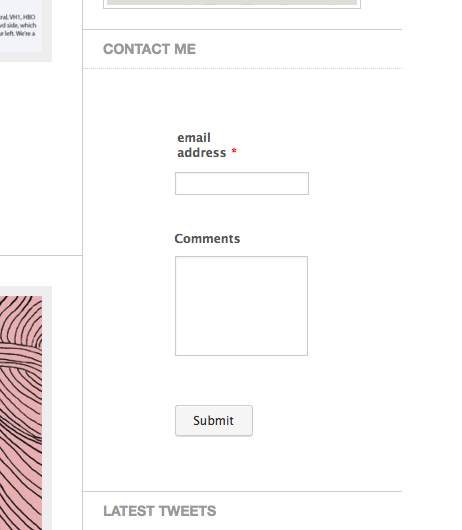 You can use this custom CSS and inject in to your form. Hope you find this helpful and if you need further assistance, feel free to contact us again anytime. You are welcome and have a great day!